If you are here, your first worry is to get to a safe place, with no more emotionally abusive attacks on you. Why all this abuse did happen to me? What is the meaning in my life of having an abusive relationship? How is it affecting my self-esteem? How do I go from my present situation of an abused wife to a different one of being a self-reliant woman, resilient to emotional attacks in the future? “Wow, I am so glad I found this page. I didn’t realize up until this point there was actually a name that perfectly described my husband’s behavior. We have been married 11 years now and I have been dealing with his PA for the past 10 and half years, when I left. I could never depend on him to come through for anything, I just knew that he would have an excuse, and usually it was quite plausible. But when he started using lies to explain away his reasons for not doing or following through with something, that’s where I drew the line. He thinks I am terrible and too hard on him for not understanding his explanations. He honestly believes because of what he gave me an excuse, that it’s ok that he didn’t call or show up to see his kids in 4 months!!! I just got off the phone with him this morning, first time I’d spoken to him in a month, and he promised he’d call me back in a couple hours, but you know what, I just wrote if off, I knew he wouldn’t and he didn’t and he will have some lame excuse as to why, but never the real truth, which is what I really want to hear, no matter how good or bad. I think people with PA are basically cowards. I cannot help what his father did to him, but I am paying a price for it, my husband doesn’t see me anymore when I talk to him or request him to do something…he sees his father, and his needling behavior is a way to get back at the anger he has inside towards his dad. It isn’t fair, and I am not to blame, and most of you in this thread, if not all of you are not to blame. I believe it is indeed a learned behavior caused from something that happened to that person at an early age, and you all here are on the receiving end of it. I don’t know what to do to be honest. I am tired of being manipulated, and blamed and misunderstood, and yet I think portraying the importance of commitment to my boys is important….but I just don’t think I can take it much longer, this behavior is cruel emotional torture. Good-luck! It is from this abuse, used as a stepping stone that you need now to take control of our own life! 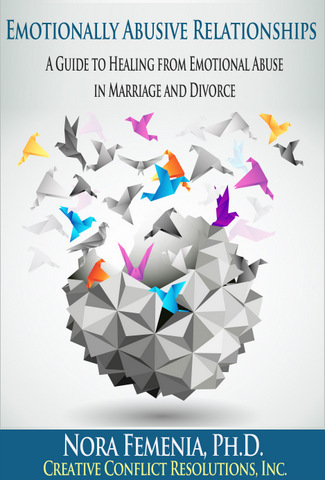 This book gives you a very different perspective: to see your abusive marriage as a sacred contract entered into in order for you to develop extraordinary resilience skills. “Emotionally Abusive Relationships: A Guide to Healing from Emotional Abuse in Marriage and Divorce,” is not only a working manual for survivors who are freeing their lives from the weight of abusive relationships. It is a complete map for your new life, charting the different milestones that signal your transformation from former victim to a more powerful, resilient and resourceful identity.